Here we are in bounding after a made basket. We will run a numbered break with each player having a specific job within the break. 5 takes the ball out of bounds and immediately looks up the floor to 2/3 running hard for a baseball pass and an easy score. If they are unavailable, 5 looks to 1 at the top of the key extended. 4 will act as a pressure release. On the catch by 1, he immediately looks up to see the whole floor and passes ahead to the open man(2). 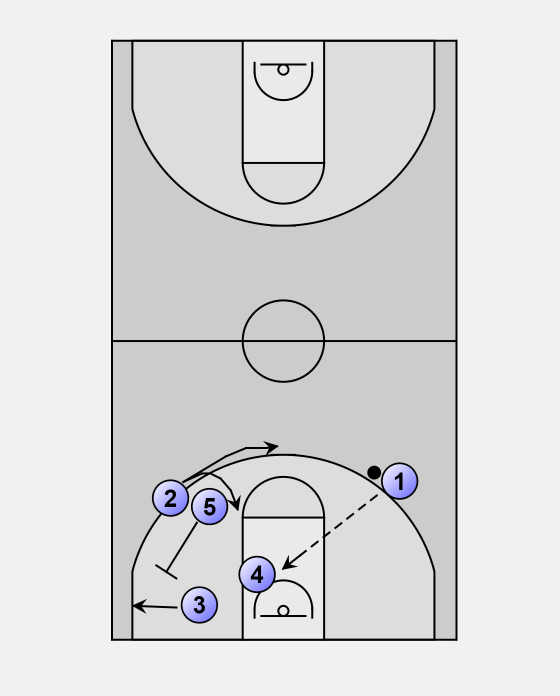 If the pass up the floor is unavailable, 1 will drive hard to the middle of the floor, continuing to look ahead to the open man. 4 will fill ballside and 5 will trail. 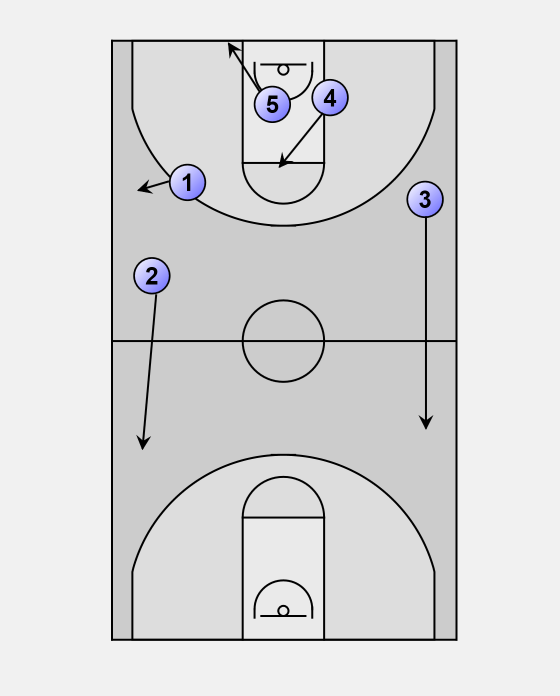 On the entry to 2, 4 will cut hard to the basket for the pass and layup. If 4 does not receive the pass, he clears to the ballside corner. 5 will fill the spot vacated by 4. 1 will sprint to high helpside position on the perimeter. 3 is sprinting hard to the helpside. 3 will follow the cut by 4 and cut hard from the helpside to the basket. 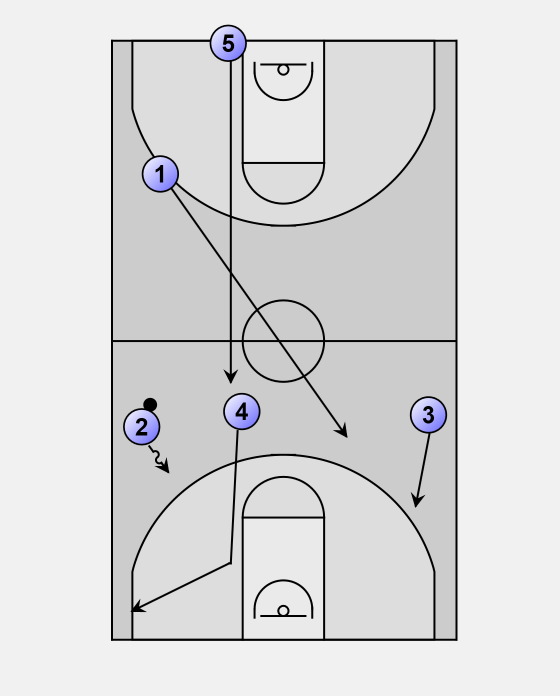 3 will establish position at the rim looking for the entry pass and easy score. 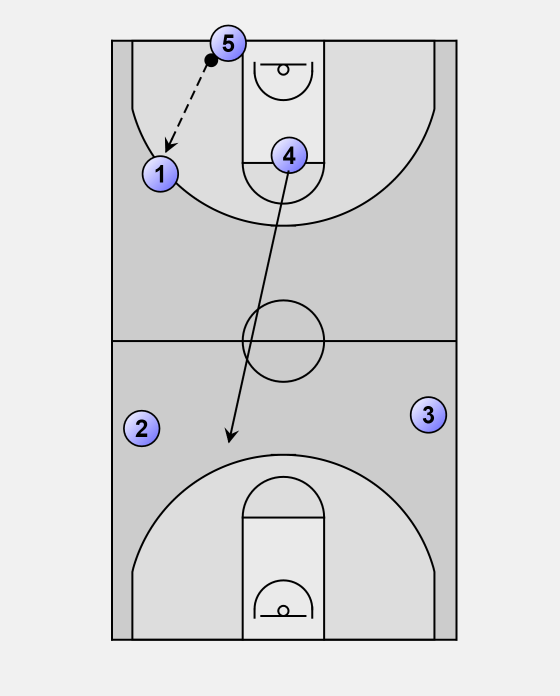 If the pass to 3 is unavailable, the ball is quickly reversed to 5. 5 will initially give a quick look to 3 to see if an entry pass is available. 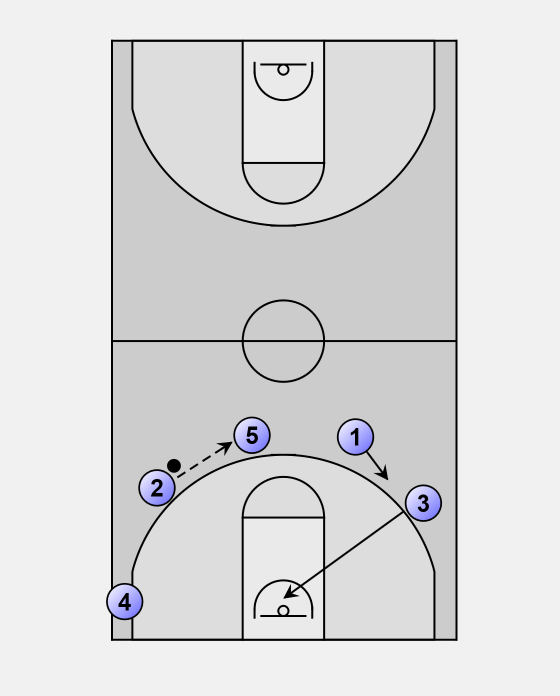 If 5 cannot enter to 3 he will quickly reverse the ball to 1. 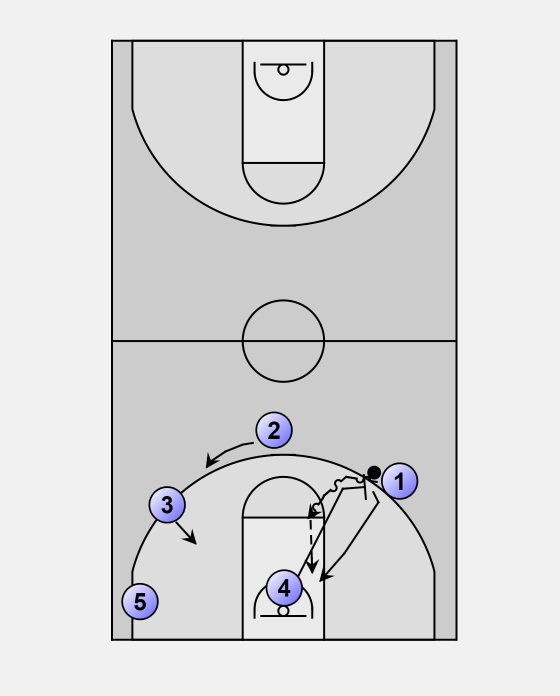 3 will set flex screen for 4 in the corner for potential entry and easy score. 1 looks to 4 for the entry pass and easy score. 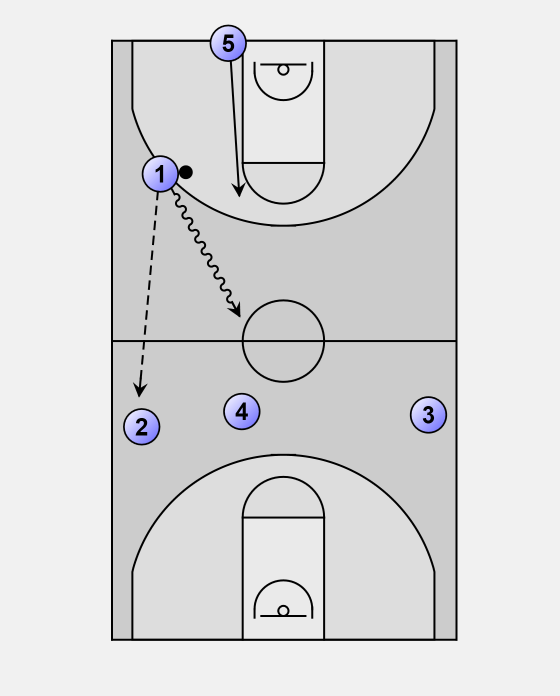 2 may curl, fill or flare for the skip pass. 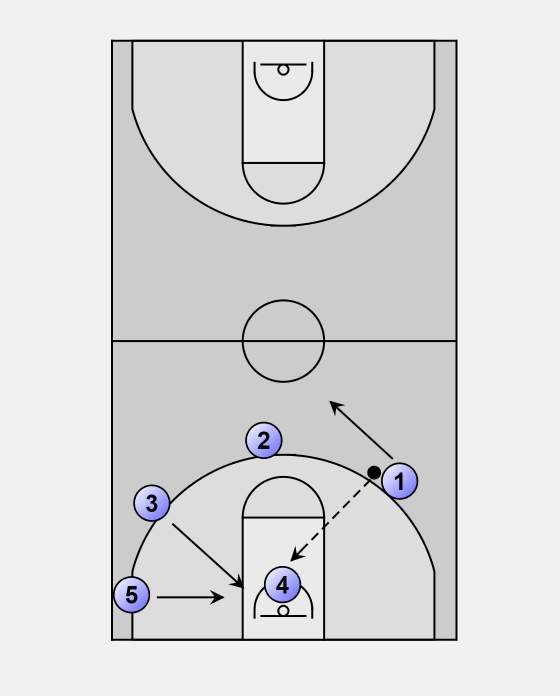 On the pass to 4, 1 and 2 will sprint to defensive floor balance. 3 and 5 will crash the offensive glass. 4 will finish his cut to the rim and then sprint to play inside pick-and-roll with 1. 3, 5, and 2 will space wide for a possible kick-out three off of the penetration by 1.